If you’re looking for where to purchase a mattress in Virginia, we have got you covered! We combed through the best mattress shops in Virginia by region and selected mattress stores based on quality of product, quality of service, and affordability. What we discovered is a little something for everyone. Whether you’re looking for something organic and eco-friendly, standard, memory foam, or adjustable there’s something for everyone. As price is a very large determining factor, we also reviewed mattress stores that offer affordable pricing, and price matching. 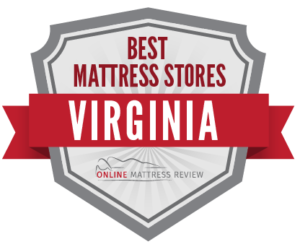 Here are some of the best mattress stores in Virginia listed by region. If you are looking for a mattress store in Virginia Beach, there are a number of great options. We took a look at all the highest ranked mattress shops in the area and found some great options. The Original Mattress Factory (3750 Virginia Beach Blvd.) offers custom-build mattresses to fit your sleeping patterns and needs. You will find a wide-selection of quality name brand mattresses at affordable prices. The customer service is excellent- friendly and very knowledgeable. Mattress Firm Hilltop (1624 Hilltop West Shopping Center) has all of the great name brand mattresses you are familiar with and fantastic customer service. Mattress Firm Hilltop offers timely and reliable delivery. At Mattress Outlet (6500 E. Virginia Beach Blvd.) you will find a great deal on a quality mattress. Mattress Outlet has a wide selection and a knowledgeable staff. If you’re looking for a fast affordable no-nonsense mattress purchase, try Mattress Outlet. When in Norfolk head to The Original Mattress Factory (144 E Little Creek Rd.) where you will find a knowledgeable staff, quality product, and affordable pricing. If you are looking to get a great deal on a quality mattress try the Original Mattress Factory in Norfolk. Mattress Firm in Norfolk (300 W 21st St.) is a great spot for a quality mattress. Customer service at Mattress Firm is efficient and consistent. For a straightforward approach to purchasing a mattress, try Mattress Firm. If you are looking for a mattress in Richmond, there are a number of fantastic options. In the heart of downtown is Mattress Firm Clearance (4914 W. Broad St.). Mattress Firm Clearance is a great mattress shop if you are shopping on a budget. Here you will still find all of the recognizable brands at affordable prices. Additionally, Mattress Firm Clearance offers fantastic customer service and easy delivery options. Mattress Warehouse (9410 W Broad St.) has a knowledgeable staff and offers high quality products that will fit you and your budget. Delivery is an additional fee. Mattress Outlet Richmond (8115 W. Broad St.) is a small business that has been in business for over a decade. You will find a great price on a quality mattress. Financing is available as are daily student specials. Richmond Bedding (9127 W Broad St.) sells mattresses and bedding with integrity. You will find a number of adjustable bed frames and adjustable mattresses. The sales clerk is knowledgeable and friendly. If you are looking for a high quality bed, try Richmond Bedding. Are you wondering: “Where can I find a mattress shop near Alexandria?” We know just the spots. Mattress Land is located in Falls Church (5520 Leesburg Pike) and offers reduced priced mattresses from sales clerks that are patient and will not rush your experience. If you’re looking for an affordable mattress shop, Mattress Land is a good option. In Alexandria try Mattress Firm Potomac Yard (3924A Jefferson Davis Hwy). Mattress Firm Potomac Yard offers high quality mattresses at competitive pricing. The staff are knowledgeable and considerate- never pusing you into a sale. The delivery is timely and efficient. If you are looking for a great mattress at an affordable price, this Mattress Firm location is a great option. If you are looking for a great mattress shop near Alexandria, you could try Urban Mattress in Vienna, VA (229 Maple Ave. E). Urban Mattress has everything anyone could want in a mattress shop including custom built mattresses, classic styles, memory foam, and eco-friendly. The prices are suitable for any budget and the sales team is knowledgeable and courteous. If you’re looking to get a great night sleep again, try Urban Mattress. If you are looking for a mattress in Roanoke, try Sleep Number (4822 G. Valley View Blvd.). Sleep Number offers a quality product as well as quality customer service. Though some of the beds are on the higher end in terms of price, this purchase will help you get a great night sleep for decades which could be worth it! Sleep Essentials (3542 Orange Ave NE) offers a number of adjustable bed frames and adjustable mattresses. Pricing is competitive and the customer service is phenomenal. If you need a high quality adjustable mattress, try Sleep Essentials! Mattress Firm Clearance is a great option for any individual who is shopping on a budget. As with all Mattress Firm locations you will find convenience and straightforward policies on delivery and financing.